It’s kind of hard to believe that its only been 3 weeks! 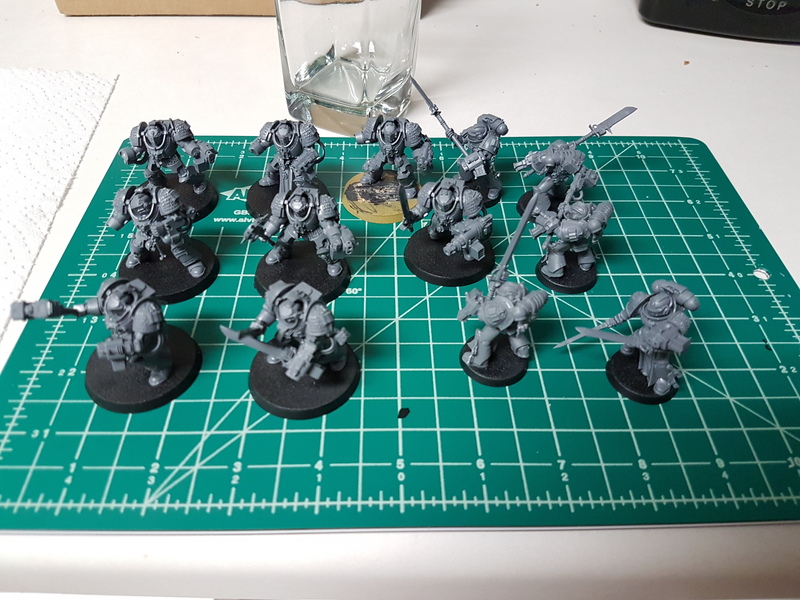 I left off with a large number of assembled, but unpainted, models that I was going to be priming via airbrush for the first time. To start it off I gave em a good wash as I got ready for bed one night and got to work the next day. 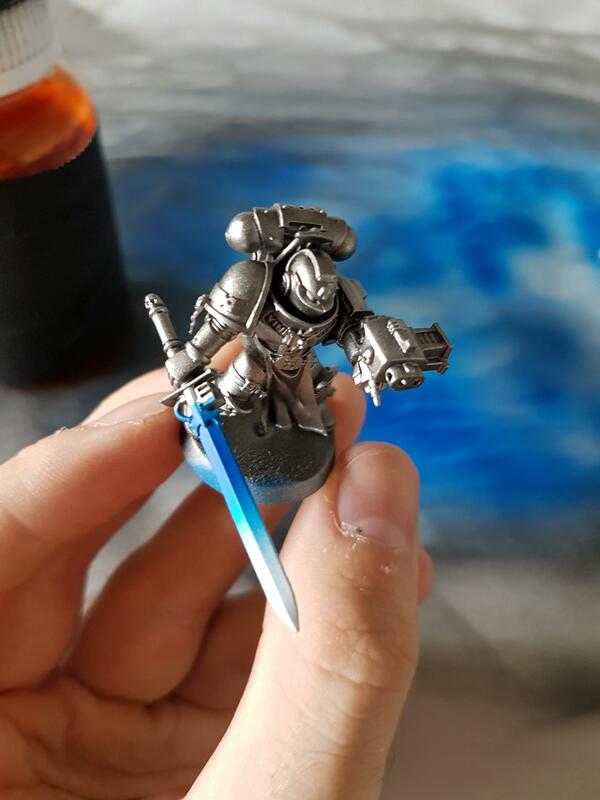 I had never used an airbrush before but a friend insisted that if I wanted to get a fantastic finish on metallic based figures like the Grey Knights that an airbrush was the way to go. It was also a pretty big bonus to me that I was going to massively cut down on the amount of time that it was going to take in order to get them to at least a table ready status. This would allow me to take my time getting each individual up to a point that I was happy sealing them. 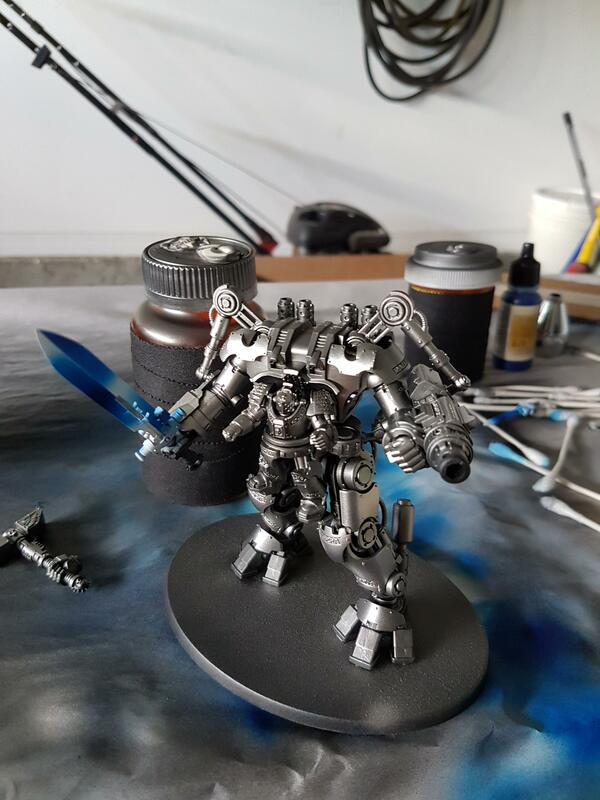 I know that some people will insist that you can do everything that you can do with an airbrush with a brush, or that it is considered “cheating” but to be honest I just don’t care. 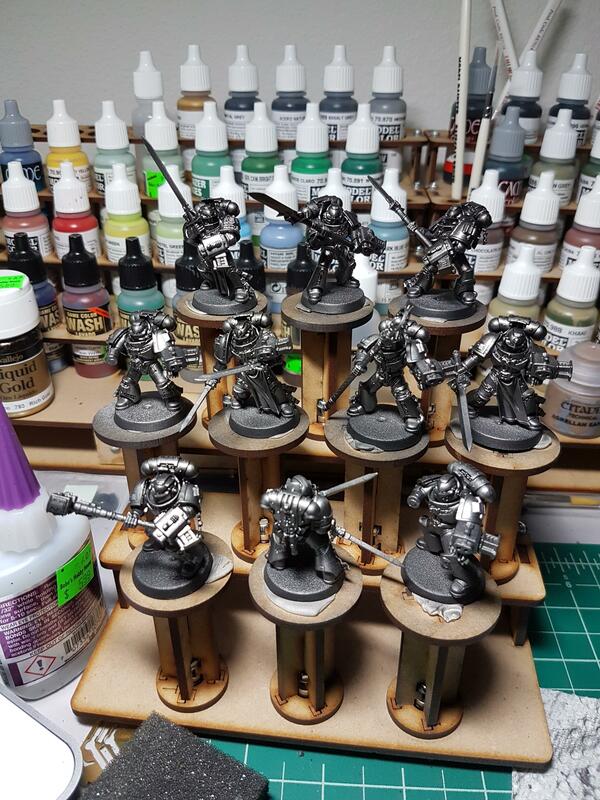 I have a relatively healthy income and not a whole lot of time for hobby stuff so if I can drop some money on a tool that I would say has reduced my priming and basecoating time to maybe 20-25% of what it used to be I am all for it. But enough preaching. I began spraying in my bedroom but then quickly realized just how much this stuff can spray even if you are being careful and set up a little workstation out in my garage. For reference I am using a Grex AC-1810A compressor, paired with a Grex XG double action airbrush. I also picked up a small cleaning bottle that goes with it, its been working pretty well for me. I began by basecoating everything in Vallejo Surface Primer Black. I found that this stuff sprays on super easy and after some of the horror stories that I have read about it I was prepared to have it to be peeling off my figures pretty shortly after application. Luckily I really havent seen much of this, it is pretty easy to scratch right off if you aren’t careful but I have been giving it 24 hours minimum to dry and that seems to work just fine for me. Looking at a figure up close, you can see that you get a really uniform finish. Nothing earth shattering, but definitely nice to get such a smooth finish out of something so low effort. After I had them primed and waited a day I sprayed them with an initial coat of Vallejo’s Metallic Color Gunmetal Grey. This color was more of a dark, shiny black and so I decided to bump my basecoat color to something a little lighter, and settled on VMC Steel. The lighting is a bit harsh but I think that you can get a general feel for the look that I got from just the base layers of paint. I cannot say enough good things about the vallejo metallics, they are prethinned for airbrush use and so you can pour them straight into your cup and go. They also clean up fairly easily, which is a big plus when you are doing big batches of things like this. Above is a Terminator with just the Steel. I later got Duraluminum as the Chrome was too bright to do a light Zenithal type technique to lighten some of them up at random angles. Here is the Chrome for reference. After getting the base colors set we have to start coloring the guy in. Thanks to another great recommendation I was able to get started with a bottle of Vallejo Old Gold. This stuff is absolutely brilliant, when you shake it up the first time and open the bottle the top layer of liquid looks just like melted gold. It is alcohol based so it can be a bit of a pain to work with for people like me who are so spoiled by acrylics, but well worth it for the result you get. 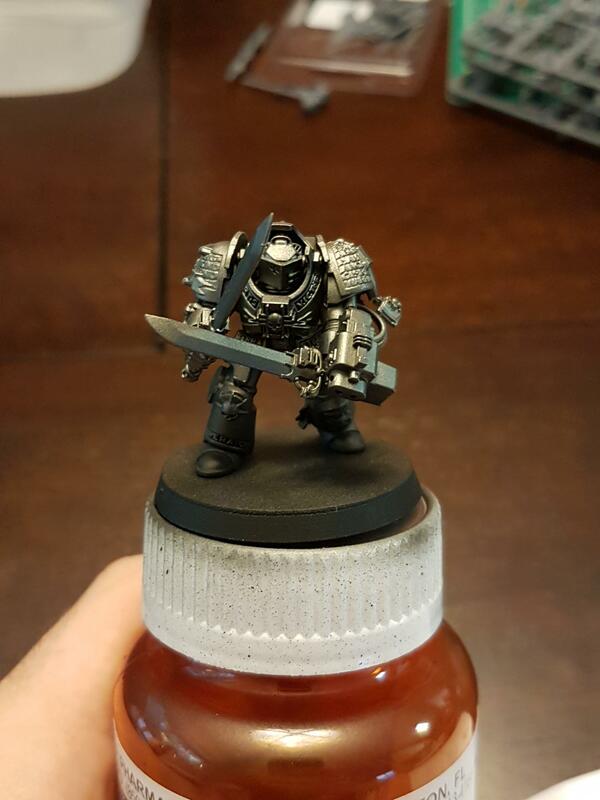 Here is one Terminator with his text lightly brushed with the Old Gold. 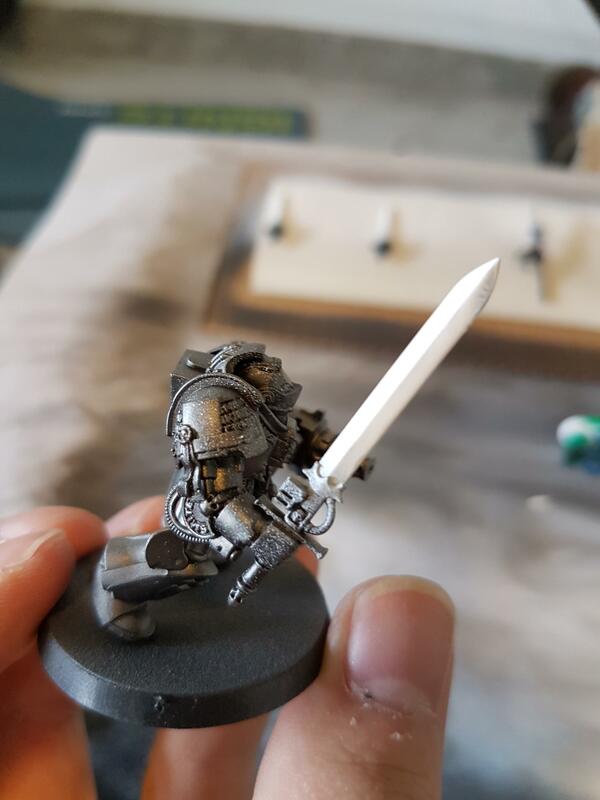 You can see that this was one of my experimental guys as I had tried to go straight from the silver to a pure white for the books/parchment with the intent of later going over it with a brown wash to give it the creamy little parchment look that I wanted. I eventually decided to just use a light sand color and cut out the middle man, it also went over the silver much better. 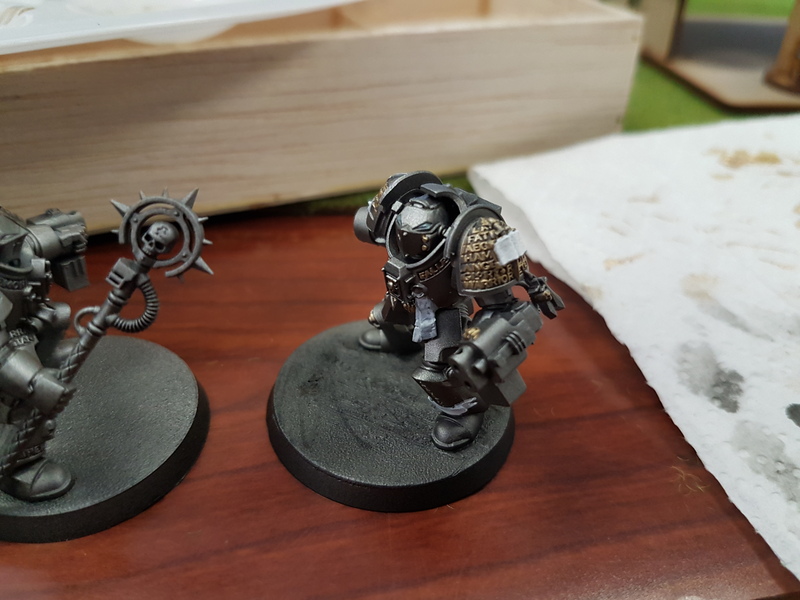 Once the details were painted (and that is still a work in progress) I decided that it was time to get to work on the power weapons. This is one of the things that people who are much more talented painters than me can wet blend and get great results, but I figured that if I have this great airbrush, why not use it. 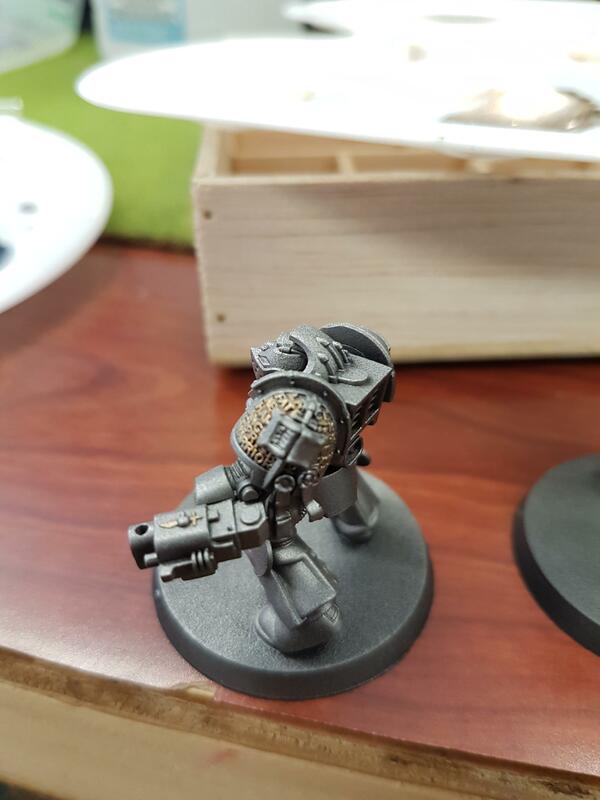 So I went down to my FLGS and picked up some Vallejo Model Airs and got to work. And that, boys and girls, is why we mask. I had seen a few videos of people airbrushing these before I got started and failed to appreciate just how much splatter there would be, even at low PSI and with a relatively small nozzle. 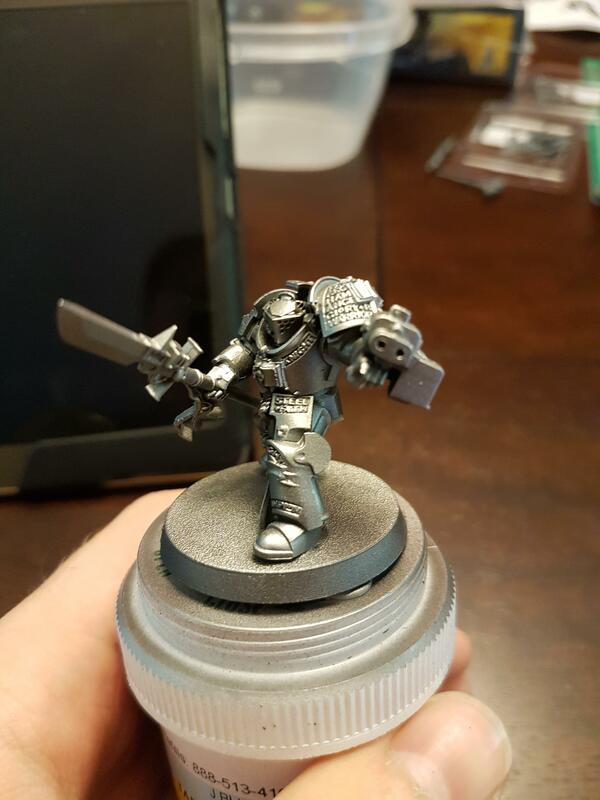 After this guy I got smart and used some Panzer putty (fancy silly putty) to mask of the majority of figure near the power weapon for those weapons that I had glued on to the figures. 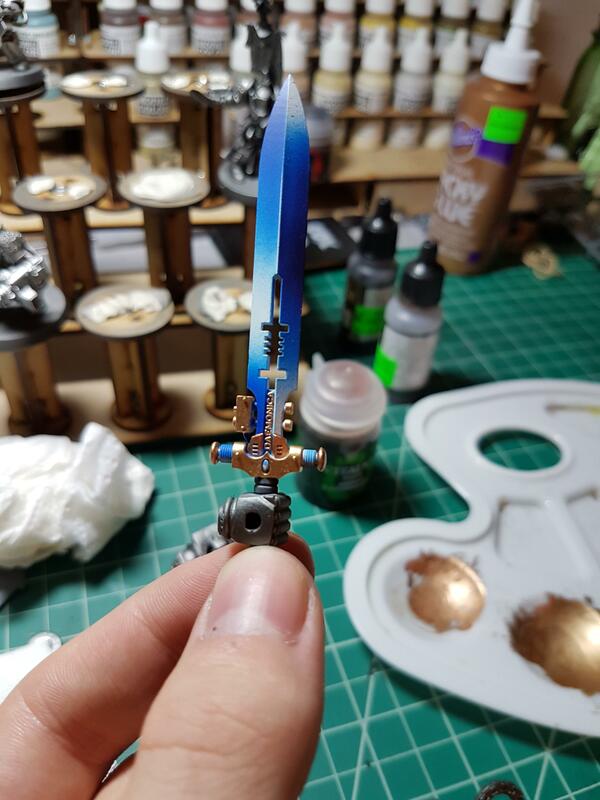 After basecoating the blade white I used Vallejo Air Blue to get the “fade” effect. 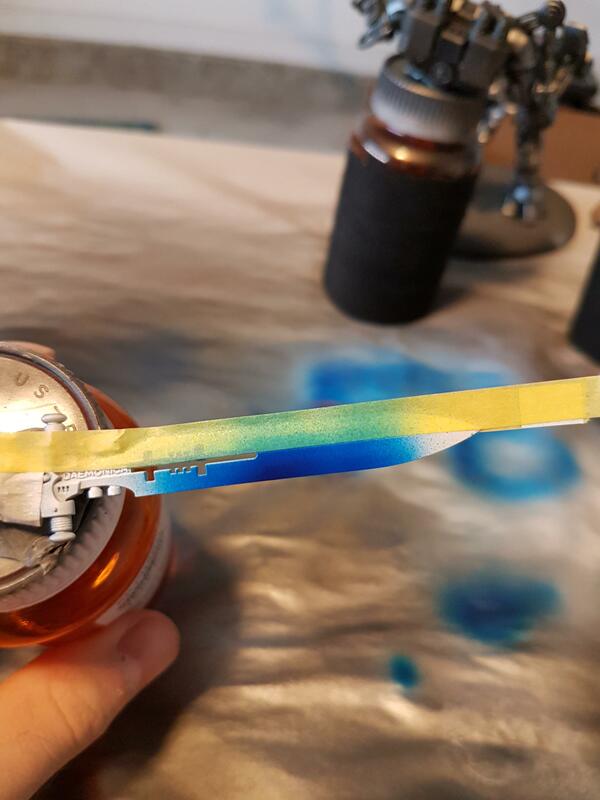 Now some people use multiple shades of blue to get a really solid fade but I found that just I could get it by just varying the thickness of the blue that I sprayed on. and then sprayed white, with one half of the blade masked. 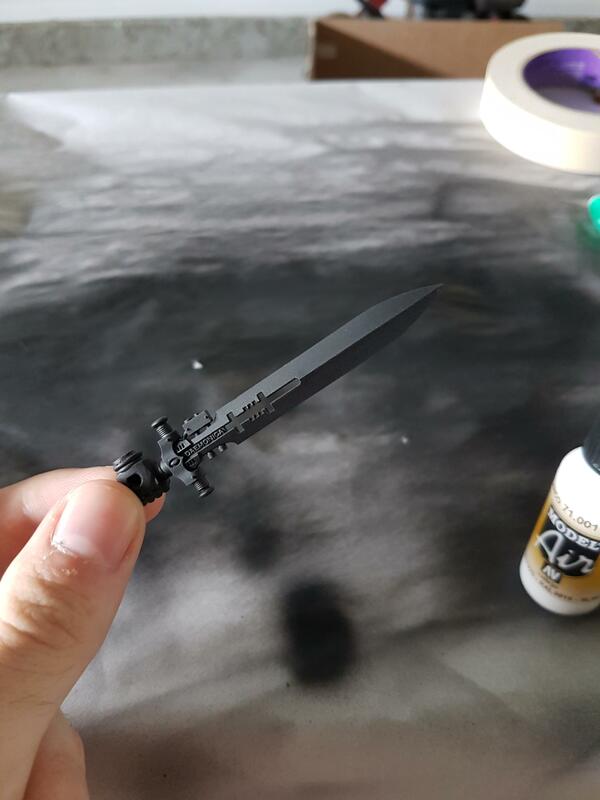 I didnt bother to do this on the smaller blades. You can see some light “speckling” of the blue on the white. I am still torn about whether to brush the white on over the blue speckles, or just leaving it to give it the fade effect you get when viewing it from 3 ft. 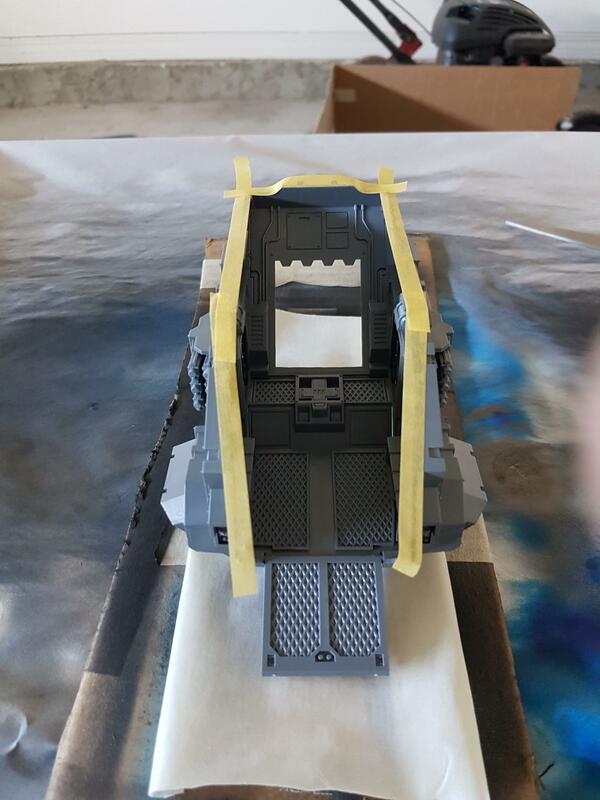 I also used Tamiya masking tape as it is cut quite thin to begin with and a lot easier to work with than regular painters/masking tape. Well worth the extra few dollars. All done, with Old Gold on the raised portions and Red Gold on the lower parts and end caps. 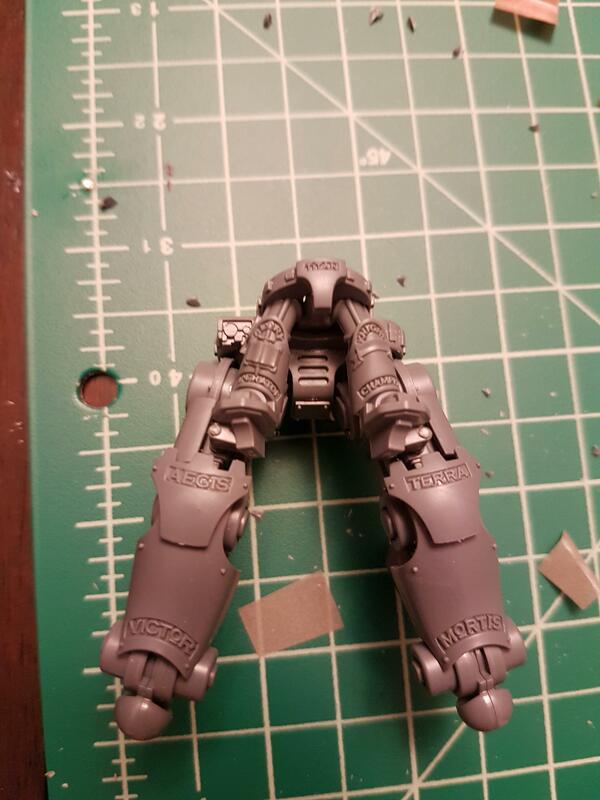 So about the Dreadknight. Ive seen quite a few posts online talking about how….ridiculous the figure is and I couldnt agree more. Its a pretty silly thing to look at, and referring to it as a baby carrier is spot on. I found that construction was fairly straightforward, but was sorely disappointed with the fact that the legs are given such a static base. 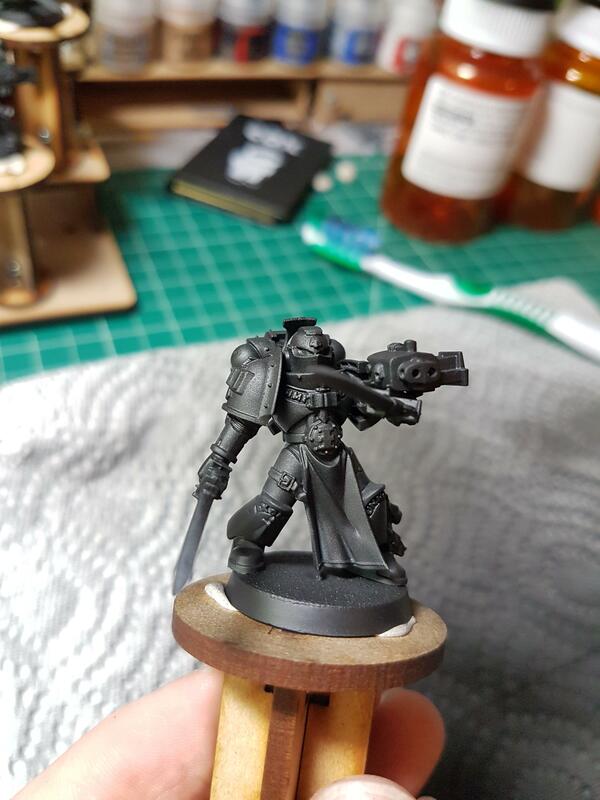 Obviously on a second build I am going to trim them so that I can have a more dynamic pose, but for a first figure I just want on the table this will do. All painted up. 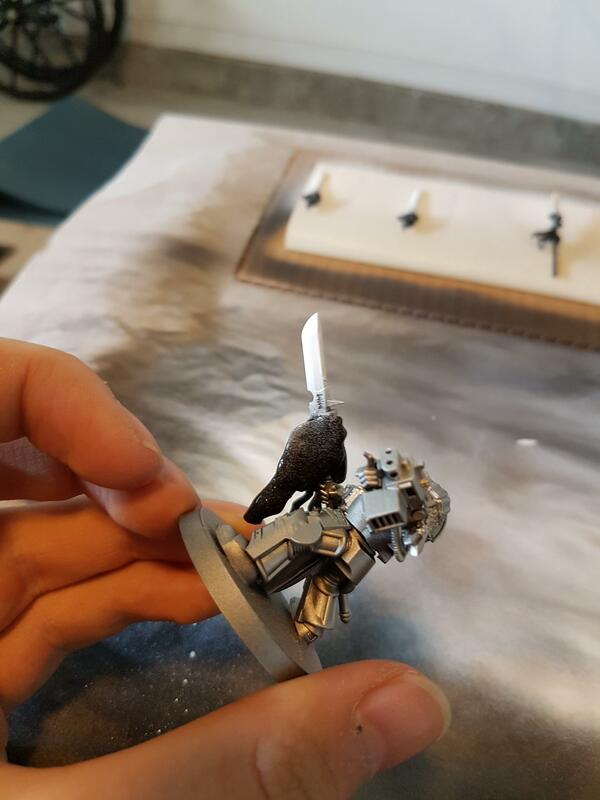 I have magnetized the sword arm so I can use the pictured hammer as well, and the psycannon and heavy incinerator can be swapped out and held in place by the tension of the piece itself. Although much of it is due to the natural light, I was very careful to highlight raised edges with the Duraluminum and leave the steel exposed int he recesses. The last thing that I constructed in this wave was a Stormraven. The assembly, once again was relatively painless, there really werent all that many parts for such a large model. 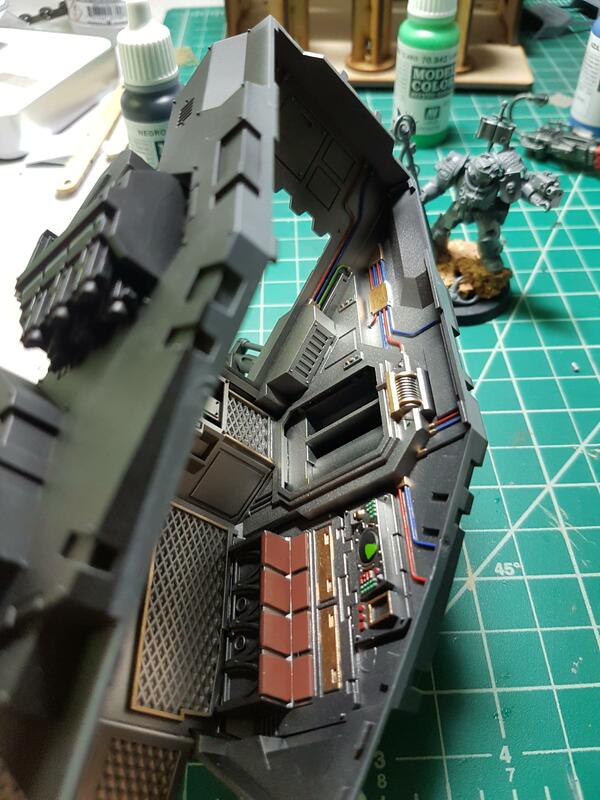 I decided that I wanted to paint the interior as I would be leaving the front and rear ramps open. 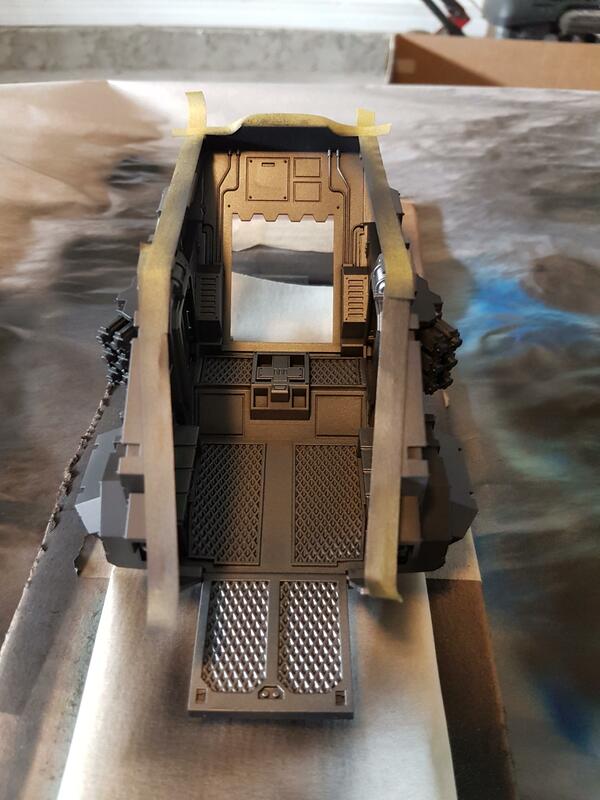 After masking off the surfaces that would be attaching to the upper hull I primed and got to work. I used the same color scheme as with the rest of the army and was pretty happy with how it turned out. 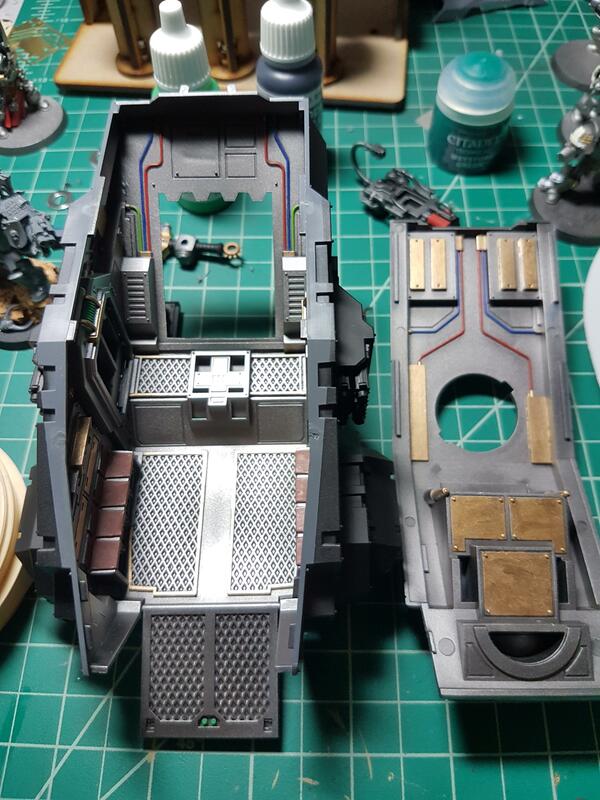 After it dried I decided to paint the different consoles, the seats, and the wiring. It was tough trying to get a good angle that showed the interior with enough light. I know that its next to impossible to see most of this when its finally closed off but it feels good knowing that its there. A bit silly but well worth the hour or so it took while I watched Stranger Things. After that I painted the top as well, then attached them and the wings and primed up. 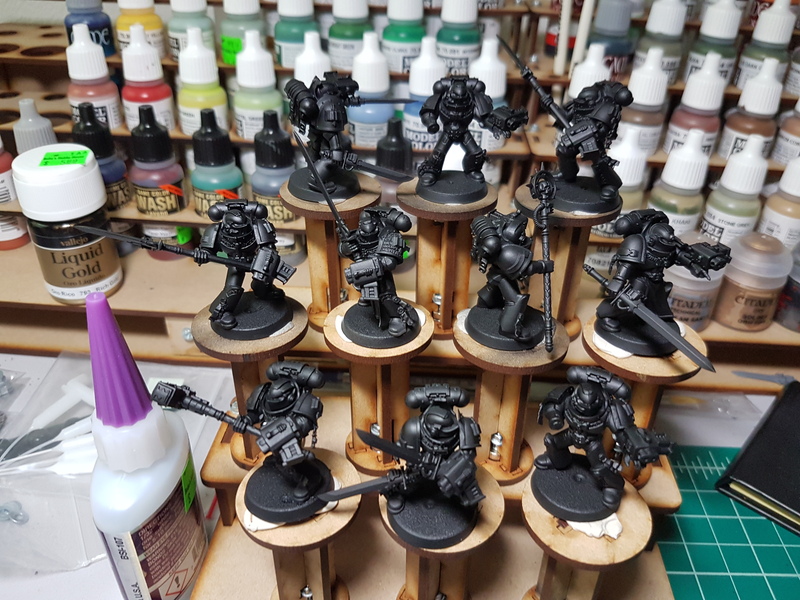 Next installment should have the fully painted Stormraven, as well as lots more color on the regular Grey Knights.